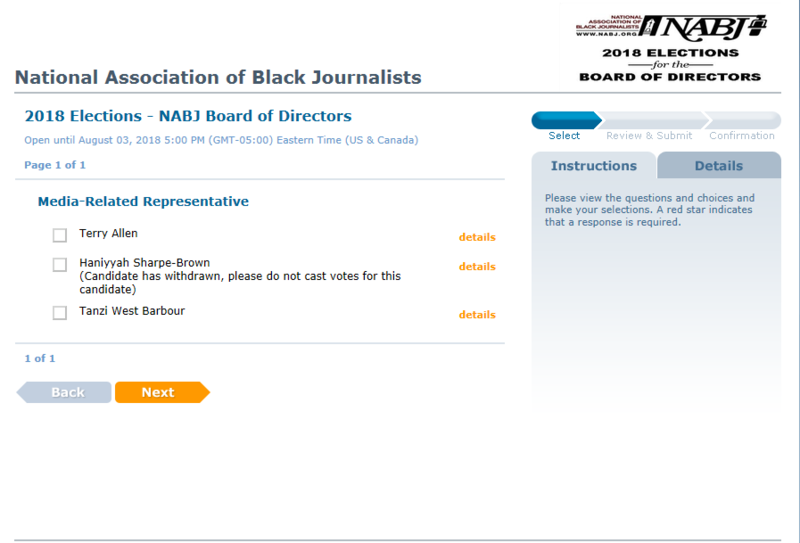 After a candidate for NABJ’s media-related representative withdrew from the race, but was not taken off the ballot, votes for that position were thrown out and a separate election is set to determine who will hold the office. The board of directors decided Tuesday to hold what it is calling a “runoff” election for the media-related representative position, two weeks after the annual convention. Typically, NABJ members vote prior to and during the convention, and results are announced during the annual Salute to Excellence gala and awards show. The second round of voting will open at noon Aug.13, according to Michelle Fitzhugh-Craig, NABJ’s interim elections chair. This gives the 433 media-related members who are eligible to vote for that position—including those who may have voted for the candidate who withdrew—another opportunity to elect their representative. Members will continue to use VoteNet, NABJ’s online election vendor. Terry Allen, CEO of 1016 Media in Dallas, Texas, and Tanzi West Barbour, chief communications officer for Wayfinder Foundation in Washington, D.C., are still in the running for the position. Haniyyah Sharpe-Brown, a Philadelphia-based communications strategist and longtime NABJ member, said she suspended her campaign on July 10 after Student Education, Enrichment and Development Chair and Student Projects Director Alexis Mitchell said Sharpe-Brown’s involvement with the Student Multimedia Project as a mentor while running for a board position posed a conflict of interest. Sharpe-Brown was told that the student project sponsorship could be viewed as an unfair advantage for mentors who also are running for office. Food, travel and lodging are covered by NABJ for students and mentors participating in the student project. There is no language in NABJ’s constitution or election rules that disqualifies student project participants or members of any task force from running for office. Interim Parliamentarian Melanie Burney said she was not aware of the lack of protocol relating to members’ involvement with the student project and elections eligibility. Two additional board members said they did not know about the voting discrepancy until the board meeting Monday. Voting for new members of the board of directors began July 2. 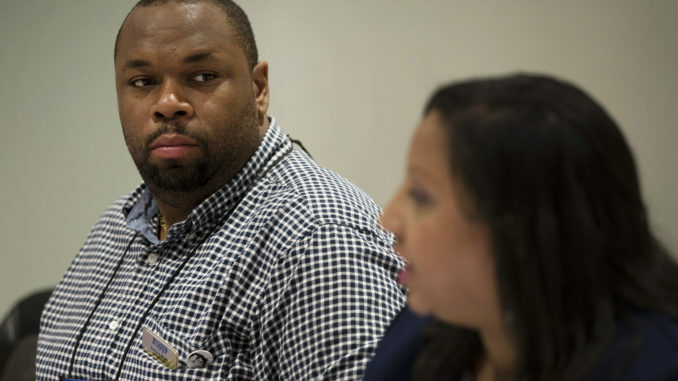 “I felt like [the conflict] put me in a position where I had to choose,” Sharpe-Brown said. So, she opted to withdraw from the race and serve as the public relations lead for the student project, a role she has had for the last three years. Sharpe-Brown submitted her letter of withdrawal dated for July 10 to Mitchell, then-Elections Committee Chair Sharyn Flanagan and NABJ President Sarah Glover. More than two weeks passed between Sharpe-Brown’s withdrawal from the race before the ballot was amended to reflect the change, according to Fitzhugh-Craig. People who believed Sharpe-Brown was still in the race continued to cast votes for her through VoteNet. A photo taken on Wednesday reflects the current ballot for the media-related rep race. Fitzhugh-Craig, whose first day as interim elections chair was Monday, said she could not explain the 17-day delay between Sharpe-Brown’s withdrawal and the ballot change. Flanagan, her predecessor, resigned from her post as elections chair Monday—the same day Fitzhugh-Craig was named as interim elections chair—due to a family emergency. While this atypical second election is a means of maintaining the integrity of NABJ’s democratic process, the need for it exposes holes in the organization’s voting policies. This is not the first time an NABJ member interested in running for election has had to choose between seeking a national position and remaining involved with the student project. In 2013, Khorri Atkinson, a candidate for student representative, was also selected for that year’s student project. There were no written rules outlining his eligibility for office as a participant on the project. However, project leaders removed him from the project. Then-Elections Chairman Mike Woolfolk recommended that the board of directors develop a policy that clearly outlines the relationship between running for office and participating in the Student Multimedia Project. Bob Butler, who was elected president in 2013, said he does not recall receiving Woolfolk’s recommendation. As president, the election committee’s report is one of the first that he would have reviewed after the convention. Glover, who was elected to her first term as NABJ president in 2015, seemed to have a different opinion on whose responsibility it is to prevent discrepancies like this. It remains to be seen whether the board of directors will end its back-and-forth with the Elections Committee and move to amend its eligibility procedures.